A protest allied with Occupy Wall Street is continuing for a second day near London's financial center, with protesters camped out outside St. Paul's Cathedral. The church square near the London Stock Exchange was the scene of protests by up to 3,000 people Saturday. Organizers told BBC News that at least 250 camped overnight. The protests Saturday were largely peaceful, but there was sporadic violence when demonstrators clashed with a police cordon on the steps of the cathedral. Church officials asked that security forces reduce their presence, and the police complied. 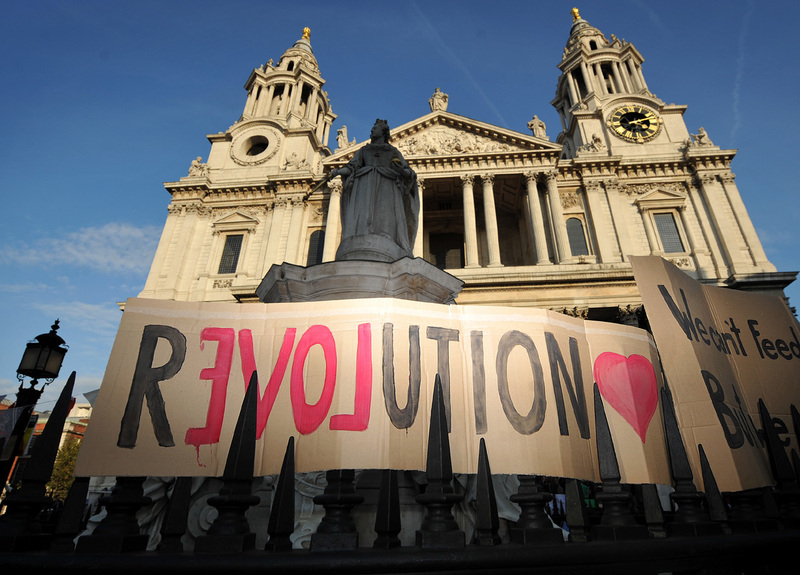 "I think people have a right to protest," Giles Fraser, operational manager of St. Paul's, told Reuters. "And people are being generally respectful. "Everything is calm and all is well," Fraser said as churchgoers arrived for Sunday morning services. "We slept fine. It was a bit uncomfortable with the pavement, but generally it was all right. A little bit chilly, but if you've camped before it's not too bad," Karis Upton, a trainee teacher camped out since Saturday night, told Reuters. For more than a month demonstrators have occupied New York's Zuccotti Park, near the city's financial cener of Wall Street, in protests against economic inequality. On Saturday protests sprung up worldwide, from New Zealand to Taiwan, in part as a response to calls from the New York demonstrators for more people to join them. The largest demonstration was in Rome, which was marred by violence as tens of thousands took to the streets. Meanwhile, the mayor of Rome said Sunday that it could cost at least a euro1 million ($1.4 million) to recover from the havoc wreaked by rioters who smashed windows, tore up sidewalks and torched vehicles after breaking off from a peaceful protest. The estimate came as clean-up work continued in damaged neighborhoods, where many charred vehicles remained parked along the streets. In Frankfurt, Germany, a group of 100 activists slept overnight in tents on Sunday in front of the European Central Bank, where 5,000 protesters gathered a day earlier. They said they plan to stay there until their calls for restrictions on global financial institutions are met.